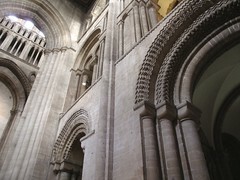 Touring around with folks from Canada in the last few weeks involved having a look at some of those cathedral buildings the English were so jolly good at tossing together some years ago. 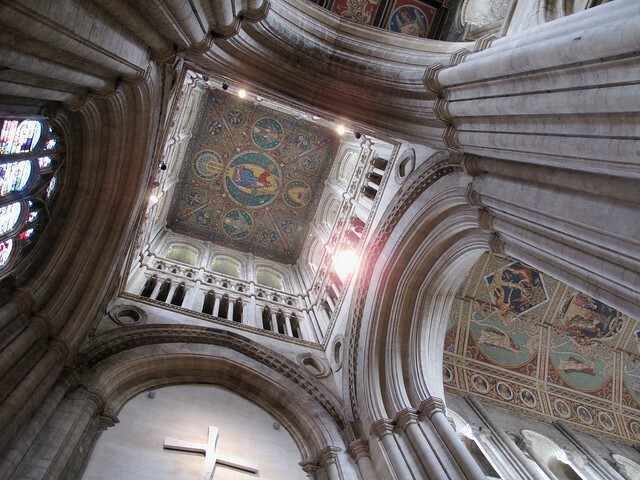 First one was Ely Cathedral, which I had never actually been inside before. We didn’t delve too far in as there was us and about 500 hyper-active school children there that day so we thought it best to get a few photos and leave them to it. A couple of videos from the past week. Time for another update, and a fresh new look to the old kuhlschrank. For this post I’m going to mostly focus on my recent trip UP NORTH. Scotland. Where everything is deep fried and the snow flakes are so big it would scare an English person back behind Hadrian’s Wall. 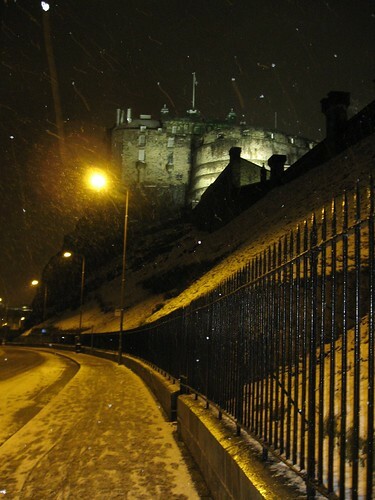 It was snowing quite heavily when I arrived in Edinburgh which made the city look at the lovelier. It was just getting proper dark out as well and things were beginning to light up. I really enjoyed my four days there. I got around quite a bit of the city (as it is rather compact) and saw: Edinburgh Castle, Holyrood Palace, the Royal Yacht Britannia, The Scottish Museum, The Royal Museum and the Scottish National Portrait Gallery and the views from Calton Hill. On Saturday Pat arrived for the weekend. That night we took in a couple ghost walks. The first tour was of the South Bridge Vaults, which are supposed to be very haunted, despite not being inhabited for very long. It was pretty spooky and we got to play around with some EMF readers. The second one was a tour by the name of City of the Dead and has been featured on Britain’s Most Haunted (you know, that show that’s filmed almost entirely in night vision camera with the lady shouting a lot and the chap who does all the medium work). Anyhoo, our guide for that tour was a bit off the wall and nearly completely clad in leather. A fair amount of the tour took place at Greyfriar’s Kirkyard, where we entered an area that has been locked off because it’s ghostly happenings have been so off the radar. This area had been used as a prison for several hundred Scottish prisoners of the English in the 17th century. An exorcism was attempted on the area but failed and the priest responsible died of a heart attack shortly there after. At one point we were all ushered into a mausoleum that was reportedly the most haunted area in the grave yard. Nothing too extraordinary happened in there, however earlier in the vaults Pat did have the feeling of someone breathing behind him. Thinking it was me, he turned around but I was at the other side of the room. The city itself was quite interesting. There is the Old Town in the south and the New Town in the north. Edinburgh is home to some of the earliest high rise tower blocks. The Old Town was so cramped, and difficult to build outwards from that they built upwards instead. 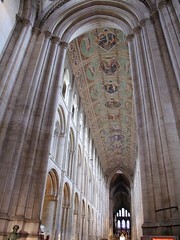 Some of the buildings reached 14 stories, and that’s several hundred years ago. The richer you were, the higher up you lived. The crazy layout with it’s numerous little lanes and closes makes walking around the city pretty interesting, and most of the street layout is all intact. Makes me all the more want to be able to go back to the City of London pre-WWII to see the old city before it got hit by bombs. Someday I shall find the Tardis and do just that. I haven’t even mentioned the train ride from London King’s Cross to Edinburgh. That alone would have made the trip worth it. Being in a train rushing along the coast, over looking the ocean. Yes please! This trip was the cap off to a rather busy Christmas. My dad got his passport in time to come over for the holidays and he and I did quite a bit of jet-setting. We did 3 days in London (during which I finally got to see the finished insides of St. Pancras Rail Station in all it’s glory and my dad was thrilled to see Greenwich Observatory and take in some classical Christmas carols at St. Paul’s), 3 days in Bristol and Salisbury (Salisbury Cathedral being a highlight) and day trips to Cambridge, Bury St. Edmunds, Norwich and Ipswich. My first English Christmas went well. I now rather enjoy mince pies and this year I could watch the Doctor Who special on TV on Christmas day rather than downloading it on Boxing Day, hurrah! Have a gander at my photos of Edinburgh over on Flickr.